Home English Actua & Analysis Public Forum: The PKK is not a terrorist organisation. Analysis of the Belgian Court Decision. 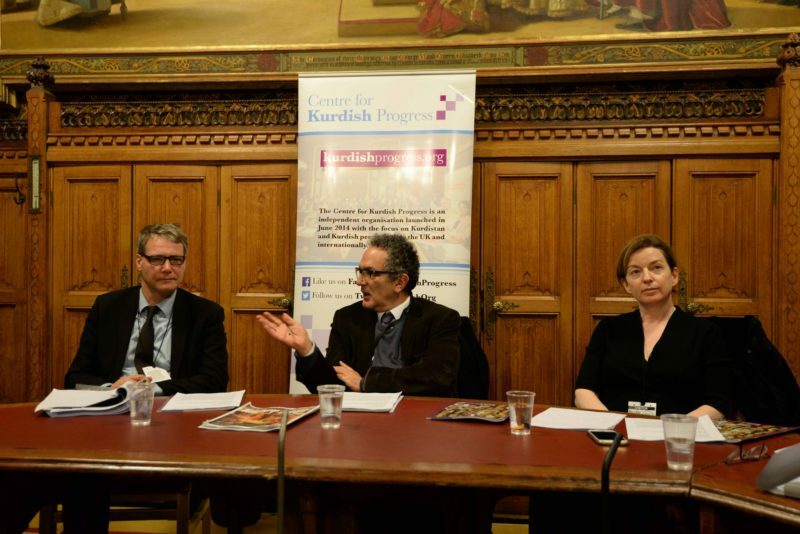 On Monday evening, 20th November 2017, the Centre for Kurdish Progress, Peace in Kurdistan and CAMPACC co-hosted a meeting at the House of Lords to discuss the political and legal implications of the recent decision in the Belgian Court of Appeal which found that the PKK was not a Terrorist organisation, but in fact a party to a conflict with the Turkish State. This landmark decision for the Kurdish Movement presents a new opening for political and legal debate in Europe around the proscription of the PKK and the consequent criminalisation of the large parts of the Kurdish Diaspora. Lord Glasman kindly hosted the event. The event was kindly hosted by Lord Maurice Glasman and chaired by barrister Melanie Gingell. Speaking at the forum were Jan Fermon, the Belgium lawyer and Acting Secretary General of the International Association of Democratic Lawyers who argued in court that the PKK is not a terrorist organisation, Alastair Lyon of Birnberg Peirce Solicitors, and Les Levidowof the CAMPACC. Les Levidow spoke about the ‘de-list the PKK’ campaign issue. He ran through a potted history of anti-terror legislation in the UK, outlining how the 1974 Prevention of Terrorism Act lead to discrimination against the Irish community in the UK, and how the Terrorism Act 2000 has done the same thing against many migrant communities – including the Kurds. That particular piece of legislation led to the proscription of numerous ‘liberation’ groups, including the Tamil Tigers as well as the PKK. He said that the definition of ‘terrorism’ in the 2000 act is too broad and hence unworkable, and that it deters constructive discussion of the issues – discussion that is essential for the path for peace. Levidow said that anti-terror legislation is often little more than an instrument of UK foreign policy and that, worryingly, it has created entire “suspect communities”.